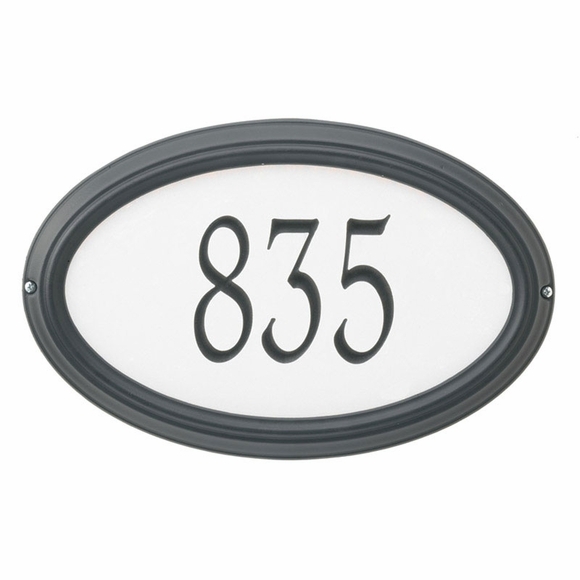 Personalized Oval Reflective House Number Sign - - Nite Bright™ one line oval plaque holds five numbers. Made in USA. Traffic-sign-grade reflective background for maximum visibility. Allows fast and easy address identification for emergency 911 vehicles, deliveries, and visitors. Medium sign is 15"W x 9.5"H x 1.25"D and holds five 4" numbers. Large sign is 20.5" W x 13.25"H x 1.25" deep and holds five 5" numbers. Frame colors: french bronze, pewter, black (shown above). High visibility traffic-sign-grade reflective background. This address sign is really reflective. I can see the white background from about 1/2 block away when I am coming home at night. The best part is the background is not the sparkly reflective kind so that during the day the sign looks very classy and not cheap.